Mt St Anne seems like an appealing base for a family but the riding destinations are probably limited. Chicoutimi is a city. And staying in the city wastes time getting out of the city. 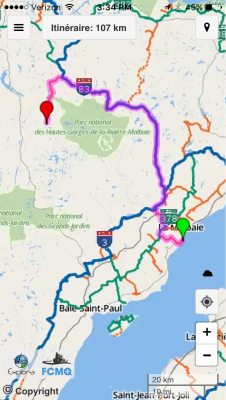 The Delta has good access to the trail faster than the Saguenenne and the Comfort Inn where you'll need to cross a few roads before getting to the trail. Fairmont Richelieu is a definite favorite. 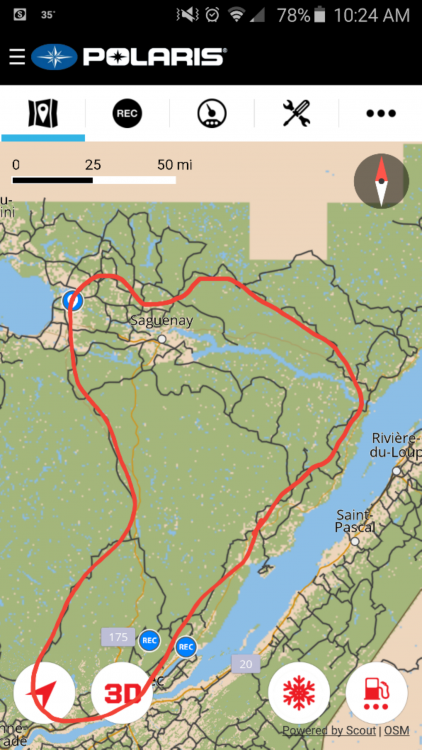 A nice ride could be to Auberge du Ravage and back - which you could do from La Malbaie (65 miles each way, mostly Super Highway trail too) or from Chicoutimi (70 miles each way). Its nice to come back the the pools at the Fairmont. The casino. . .comme si comme ca. From Chicoutimi/Jonqiuere there are lots of options and getting to Valinouet (the ski hill on Mt Valin) is about 45-50 miles. La Baie and the giant Yield sculpture would be a nice ride. The caves. L'anse St Jean. thank you for this feedback, very helpful. What is "Auberge du Ravage"
"Auberge du Ravage" is a beautiful log resort South of the 83; 45ish miles from the "Casino" if you get to 383 you have gone too far. Great lunch spot make a 90 mile day. Oh yea Fairmont Richelieu is all that and more, reminds me of "The Shining" grand old hotel with St Lawrence views. thank you for the reccomendation. would we be able to do a loop, or will it be one way out and same way back? i was checking the online trail map. Do you mean if we get to highway 381 we've gone too far? Or is 383 a trail I'm on seeing on the map? Auberge du Ravage is in Saint Urbain, just off of Trail #3? I requested a 'hard copy' map from one of the local CVB's but I haven't recieved it yet. I really do appreciate eveyone's input. I would be 'flying blind' without it. Quebec is such a huge place!!! Zoom in on Via Explora and off trail 83 there is an orange local that takes you to Ravage, it would not be a loop but well worth the trip. 83 is big wide and fast easy to ride with 2 up. If you get to 383 on 83 you have gone to far but the left onto local trail is well marked to Ravage, after you turn W/N on 83 it's the first trail to the left. Via Explora can be blown up by turning wheel on mouse and local trail will show up. Ravage is at the red waypoint on the map. Try hitting 83 and the trail into Ravage after Thursday night because that is typically when they groom that trail. I've noticed that some hotels on viaexplora aren't placed on the map correctly sometimes. thank you for the extra details! Casino is a classic, outdoor pool is awesome for kids of all ages, if the trails hold up there's 200 miles of goofing off (dead ends & figure 8's) on the locals & 377 & 378 & 3. Plenty for 2 days with the young'uns on the back. This property you mentioned, ET HÔTEL LA SAGUENÉENNE, is where I'm currently booked. I'm just trying to make the tough decision whether to go there, or change to Fairmont Richelieu. I think i would rather stay at Fairmont Richelieu, but I assume i have a better chance the conditions will be better up in Saguenay area. Then, when in doubt, call the lodging and ask how many sleds (or trailers) are in the parking lot? Gonna be tough in and out of town in Chicoutimi. No doubt bare pavement leaving LA Saguenenne. Not terrible but certainly more to deal with then at the Fairmont. I think lots of snow still in Charlevoix and I would go to Fairmont. Especially with family in tow. Sled rental on site there I believe and they can lay out a route for you. Thank you for your '2 cents'. You gave me the gentle 'nudge' i needed to make the decision. I was really on the fence between the two, but if getting to and from the Fairmont will be better trails, that seals the deal. Which is great, because I would really prefer to stay at the Fairmont anyway, mainly because I know it will make my wife happy ! Also, onsite rental gives me a lot of flexibility. I think I'll book 1 day, and see how it goes with the kids, and add the second if I think they can take it. That really wouldn't be possible if I went to Chicoutimi. The rental place isn't close enough to the hotel. A BIG 'Thank You' to Everyone for your insight and advice! I would have been lost without it! 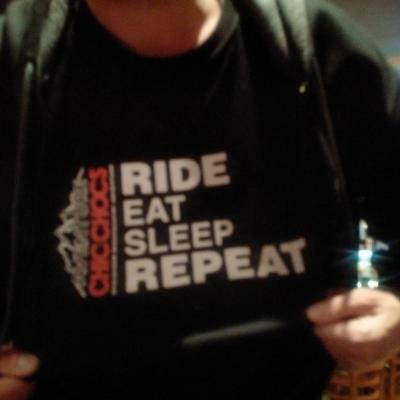 I'm really looking forward to my first ride in Quebec! Can't wait to play in the Snow!! i'll be sure to post some pictures of the trip! 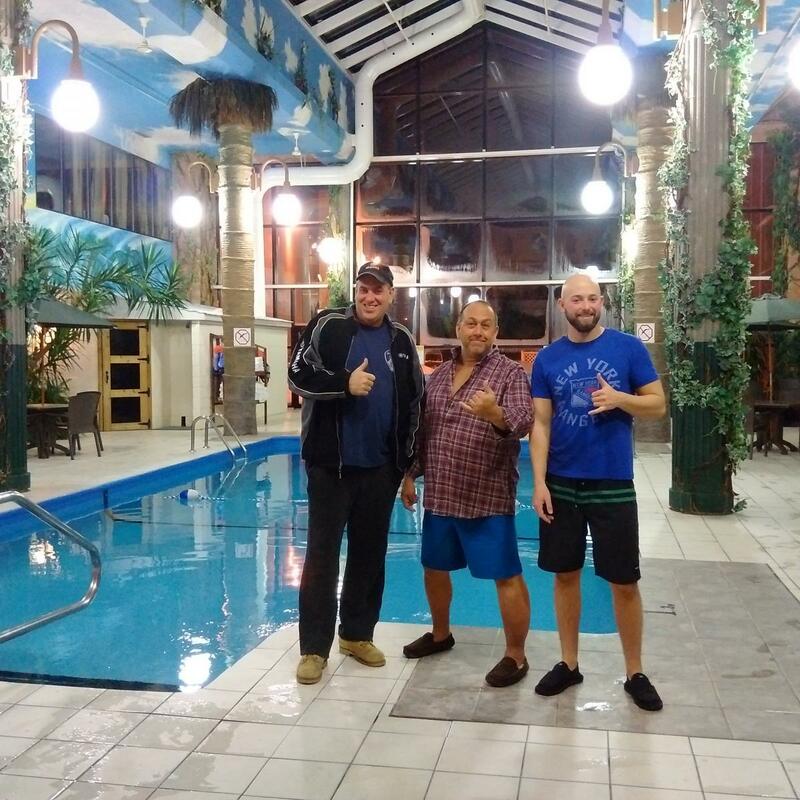 I am here in La Malbaie area now. The trails have been fantastic the past 4 days. They will be getting some 'freshies' towards the end of this week so I expect the trails to hold out for awhile yet. Thanks for the post! Great to hear the trails are in good shape. Based on temps and weather forecast for this week, they should hold up very well. I'll be arriving this Thursday, can't wait!! The snow depth still looks good for Charlevoix. Trail 83 is usually a very good trail. There aren't any facilities on 83 once you leave trail 3 heading north. You won't see much signage but it is really the only trail. No intersections to get lost at. Top off the gas tanks in the morning. Ask the rental place how far you can go on a tank of fuel so you don't get caught short. If they tell you in kilometers, remember to convert to miles. I don't remember if there is gas at Ravage. Maybe someone else can say. Around La Malbie, trail 3 and the local trails you should find plenty of places to stop for gas, food, pee break, etc. There will be good signage there. One caveat - you may not want to ride in New Hampshire after this trip. Enjoy the ride and be safe. Thanks for the info & pointers! "One caveat - you may not want to ride in New Hampshire after this trip." <-- I've been worrying about this LOL. This happened to me with skiing. Skied NH/VT my whole life, then moved to Colorado for a while. Then, when I came back east, I couldn't help but compare. And the west wins, hands down. A-Basin, Beaver Creek, Keystone, Copper, Breckenridge, Vail, Aspen.. how can you compete with that? I'm sure the same will happen to me after this trip. I'll be comparing trails/conditions, and I know that the land of the quebecois will win. So, I'll have to make due with the occasional 'epic' adventure. I'll be sure to post a few pics after the trip! Just checked the forecast for La Malbaie and they're calling for a major winter storm up there tomorrow through Friday with 10 to 15 inches of snow !!!! Sacre Blue !!! Yeah, I can't believe that storm is coming. Crazy! I'm wondering what it's going to be like on the trails on Friday. It will be interesting. But I'll take it!! I bought a New Sled this year. First time I've ever bought a new machine, and it's my dream sled. 2016 Ski-Doo Renegade XRS 800 ETec. It was delivered in October (of course it came early) and I waited...impatiently...for snow. Then winter came...or more accurately, didn't come. At least to the Majority of New England. The closest riding for me (and many) all season was Pittsburg NH. I rode there twice, and once on Winni. The rest of NH never opened their trails. Something I have Never seen in 25 years of riding. So, the fact that Quebec is getting this storm, the weekend I'll be there, puts a BIG smile on my face. Christophe had raced in Cain's Quest and is a backcountry snowmobile guide. He will take you to areas off trail that are just spectacular. He and his lovely wife Sylvie are great people to meet and I am very lucky to call them friends. I wish the place wasn't 9 hours away. Wow, very nice! Thanks for sharing! We are at Ravage tonight. Started in Beaupre and ran TQ3 north. Trails were mid-season conditions. 83 was awesome. 23 and 369 are supposedly good. Trails near St. Foy might be thin right now. Based on what I saw I would go for it. Rivers and lakes that I crossed were fine.